HomeComic PreviewsJudge Dredd: The Cursed Earth- Uncensored Out Now! Judge Dredd: The Cursed Earth- Uncensored Out Now! Now with the previously ‘banned’ material! The orginal Dredd epic complete, unexpurgated collected wuth the ‘banned’ material for the very first time! Mega-City One, 2100. A deadly plague developed during the brutal ‘Great Germ War’ has reached the futuristic metropolis of Mega-City Two, located on the West Coast of the USA. 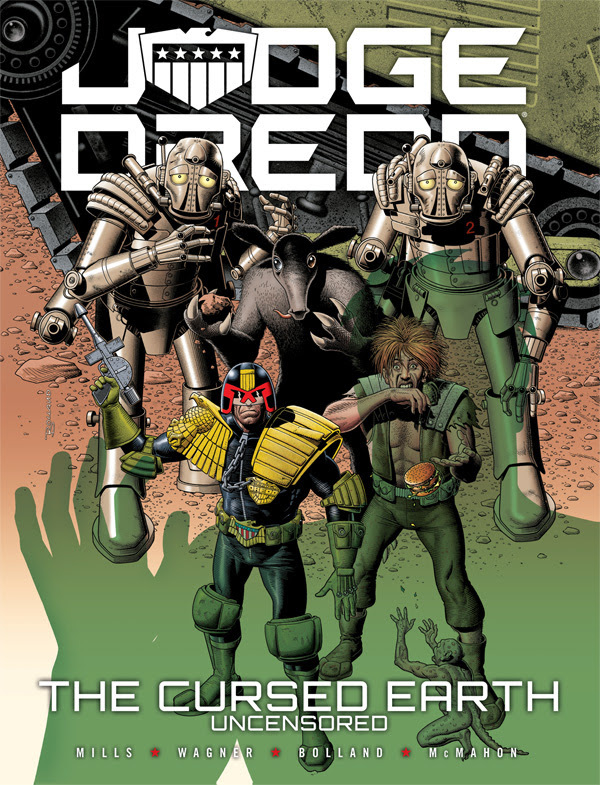 Charged with delivering a life-saving vaccine to the citizens of the disease-ridden city, Judge Dredd and a small crew of Judges, war droids and the lawbreaking biker, Spikes Harvey Rotten, must travel a thousand miles across the radioactive wasteland known as ‘the Cursed Earth.’ Experience the complete Cursed Earthsaga for the first time – a sparkling action-packed parody from Pat Mills and John Wagner, complete with sumptuous color spreads from Brian Bolland and Mick McMahon.